The number of designs available to put on a quilt is infinite. There are thousands of professional designs for sale as paper pantographs. If you can draw it, you can quilt it. However, all designs are not equal. Some are tighter and denser than others, while others are open and barely quilted at all. Some are flowery, or whimsical, or modern. And still others are traditional, geometric, or repetitious. But with all those different designs to choose from, sometimes straight line quilting is all it takes. This is Sallye and her elephant. This is a laser cut fusible pattern called Holi Ganesha by Madi Hastings. Sallye, like many others who have done similar fusible applique wall hangings, did not stitch down each individual, tiny piece of fabric. So when deciding how to quilt, she wanted to be sure that she could sew across them all to more permanently anchor them down. She used Millie’s incredible electronic channel locks to help her make those lines so straight. She also intentionally made them vary in the space between them so she could be sure to hit every piece. The resulting texture is lusciously rippled. The wider spaces at top and below help frame out the piece a bit. I just love the gray behind all those bright colors. Erin from HouseonHillRoad.com created this pretty quilt not too long ago. This is an original pattern by Erin called Rinse and Repeat and you can get the pattern for yourself at her website by clicking here! The idea is so pretty and unique. But at the same time quite simple and understated which makes it so elegant. I love the large swaths of negative space above and below. It draws your eye to the diamonds in the middle, but doesn’t overwhelm you with too much to look at. Because the diamonds are the focal point, quilting an elaborate design in all that white would distract you. A straight line, also obtained using Millie’s electronic channel locks, keeps it nice and simple. And the rippled texture is just yummy to curl up in. This is a soft and cuddly quilt. Erin quilted all the diamonds with a different free motion filler for each fabric. Starla used a lot of straight lines in her quilt, but without the use of the channel locks. This is a quilt for her son and his new bride. She created a checkerboard effect by quilting back and forth horizontally in a square then rotating and quilting back and forth vertically in the next and so forth. The pinwheels were given a slightly different treatment so they, too, could pop out. Can you see the checkerboard? It’s very subtle, which makes it so fun! Gloria made this baby blanket for a grandchild. She saw the pattern on Pinterest and knew she had to make one! She quilted two lines about a quarter of an inch above and below every seam in the quilt. The quilt is pieced in triangles. The square quilting just adds another rich layer of design in this striking but simple quilt. She didn’t use the channel locks, because there is always variation in sewing and keeping the seams in line with the channel lock would have been difficult. The hopping foot is a quarter of an inch around the needle. So she just kept the hopping foot along the seam and then again along the line she had just sewn. As an extra special personal touch she quilted her grandson’s name and signed it with love in the bottom corner. This is super sweet! We often talk about shapes and circles and other two dimensional designs when we talk about quilt design. But there is beauty in the one dimension. Sometimes straight line quilting is all it takes. Previous post: Longarm Guild: Getting Fancy with Circle Rulers! I’m Angela- Triplet Momma. Quilter. Traveling Educator. Designer. Thread Bimbo. Send me the Newsletter each month! 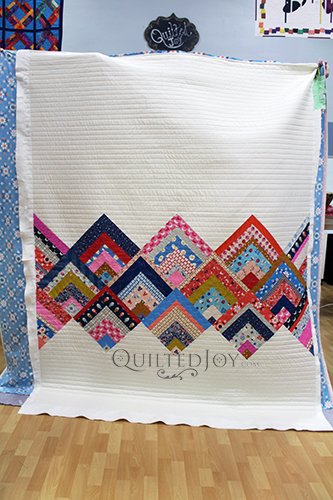 Visit Quilted Joy's profile on Pinterest.